1169 And Counting.....: 'THAT UPRISING WAS NOT A CRIMINAL CONSPIRACY' - O'BRIEN, 1848. 'THAT UPRISING WAS NOT A CRIMINAL CONSPIRACY' - O'BRIEN, 1848. 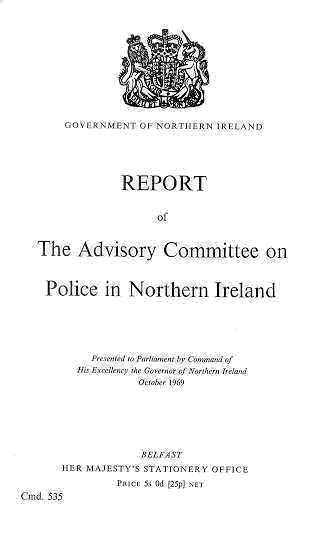 ON THIS DATE (10TH OCTOBER) 49 YEARS AGO : UNHINGED 'POLICING REPORT' PUBLISHED. British 'Baron' Brigadier Henry Cecil John Hunt CBE DSO ETC (! )(pictured - full title/name -'Henry Cecil John Hunt, Baron Hunt of Llanfair Waterdine') was born in Simla in 'British India' on the 22nd June, 1910. His father was Captain Cecil Edwin Hunt, of the Indian Army, and his mother was Ethel Helen Crookshank ; the family were steeped in the British 'stiff-upper-lip' tradition of the ruling class and, whether in India or Ireland, were deemed by their fellow 'establishment' members to be 'safe pairs of hands' when it came to defending 'the empire'. And that 'empire' needed defending, then and now : in the six north-eastern counties of Ireland, the 'Royal Irish Constabulary (RIC)' were devoid of the few token catholics/'nationalists' that were present in its paramilitary ranks in the other 26 Irish counties and that fact was highlighted by the actions of those Six-County uniformed thugs : a British 'royal commission' report on the 1857 pogroms against Belfast catholics/'nationalists' found that the RIC 'police' force had behaved in a sectarian fashion and had actually led attacks on catholic/'nationalist' homes and businesses, recommending that 'a total change should be made in the mode of appointment and the management of the local police..'. That same pro-British paramilitary outfit, this time operating as the 'Royal Ulster Constabulary (RUC)', exposed themselves again at Burntollet in January 1969, and in the lower Falls in August that same year, when out-of-uniform and uniformed RUC men and 'B' Specials co-ordinated the attacks on catholics/'nationalists'. In a false flag operation to appear 'neutral/even-handed', Westminster announced (on the 26th August 1969) that 'Lord' Hunt was to prepare a report (the remit was 'to examine the recruitment, organisation, structure and composition of the Royal Ulster [sic] Constabulary and the Ulster [sic] Special Constabulary and their respective functions and to recommend as necessary what changes are required to provide for the efficient enforcement of law and order in Northern Ireland... [sic]') on the RUC (known as the 'Report of the Advisory Committee on Police in Northern Ireland [sic]' but better known as 'the Hunt Report', pictured) and that whitewash was eventually signed-off on on the 3rd of October that year and was published on Friday 10th October 1969 (49 years ago on this date) and presented to the pro-British 'parliament' in Stormont on that same date. The British objective was to salvage the 'credibility' of 'policing' in that part of Ireland by introducing so-called 'reforms' to the then 'policing' format - however, as expected by Irish republicans, the 'reforms' were not real but were a sleight-of-hand operation - the 'B' Specials were disbanded but were replaced by the 'Ulster (sic) Defence Regiment' (UDR), which were attached to the British Army rather than to the RUC. But 90 per cent of all 'B' Specials in 1969 joined the UDR at its formation in 1970, meaning that to all intents and purposes the UDR was composed of former 'B' Specials and those same men and women, in a different uniform, were then lauded by Westminster as a breath of fresh air! 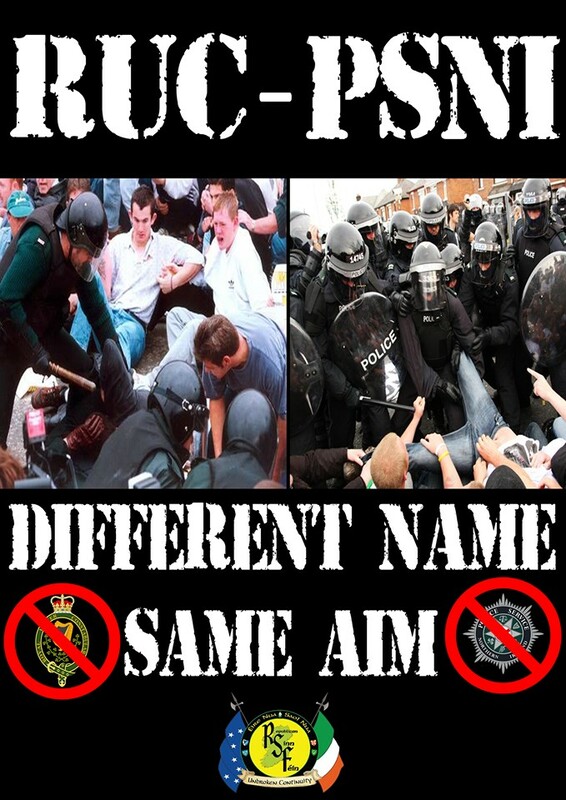 'Fool me once, shame on you : fool me twice, shame on me' : on the 4th of November 2001, the RUC 'became' the PSNI and the first of those 'new police officers' took up duty, in Ireland, on behalf of the British Crown, in April 2002, supported by the political 'establishment' here in the Free State. As James Connolly said - "Ruling by fooling is a great British art with great Irish fools to practice on." How right he was! When at a recent meeting the Waterford Corporation considered a resolution from the Roscommon County Council calling for a ban on the importation of evil literature, comics and newspapers, particularly Sunday newspapers extolling crime and divorce, they decided to ask the Roscommon Council for more detailed reasons behind the resolution. The reasons are so many and so obvious that it seems extraordinary that any public representative should have to ask for them. Most of the imported papers are morally unsound - they glorify crime, as when an English Sunday newspaper printed in serial form the story of the gaol-life of a released convict. They glamourise divorce, make the most of every scandal and are generally vulgar. EXCLUSIVE!! STORM KNOCKS CORNER OFF IRELAND...! 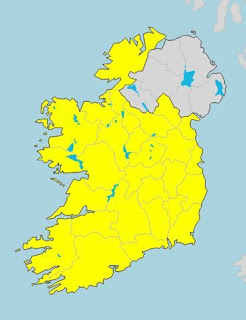 This is the graphic used this morning (Wednesday 10th October 2018) by 'Met Éireann' to accompany notification about an in-coming spell of bad weather for Ireland, under the heading 'Status Yellow weather alert issued for whole country' (from here). 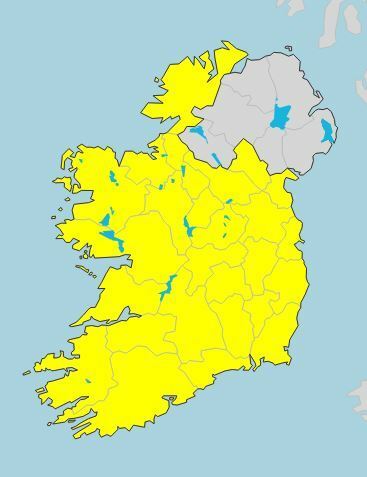 Not only are we gonna tell ya that, in the main, there's no such thing as 'bad weather', only unsuitable clothes for the climate at hand, we also want to assure you that that weather system mentioned is obviously a well-behaved one (albeit partitionist in nature) as it apparently does not intend to affect six of our counties. In fact, James Connolly was attacking the Costelloe's, de Valera's, Cahir Healy's and Aknefton's of his day. But fantasy, not fact, seems to be Aknefton's strong point since he later on refers to "the purely sentimental brand of green patriotism which is rearing its head again". Walt Disney could possibly visualise 'green patriotism rearing its head' but I doubt if even he could distinguish between the 'different brands'. But Aknefton has a couple of more surprises for us - right in the middle of his diatribe he says "Aknefton desires a united Ireland as much as anybody - back to Wolfe Tone!" Now who twisted his arm to wring that cry from him? Let us thunder back in chorus 'Hurrah! Back to Wolfe Tone. Break the connection with England!' Let it be the catch-cry of Sinn Féin, for never was a return to Wolfe Tone more necessary. He is the cornerstone and very basis of the whole Republican Movement and his cry of 'Break the Connection' covered everything. It meant not only the military connection but to break the political, social and economic connection with England. Since the first positive step to ending the terrible unemployment and emigration figures must be to break England's stranglehold on our nation let us, in ainm De, join with Aknefton in urging "Back to Wolfe Tone". After three hours at the airstrip, and an hour after Sembrar, a Colombian human rights organisation, had got the military to communicate to the captain that they should be allowed to proceed, the three received clearance but, according to O Loingsigh, the captain told them they had missed the last truck going to La Punta, their first destination, and that they would have to stay in the town overnight anyway. The drive to La Punta requires a four-wheel-drive jeep or lorry, as a car wouldn't get very far, particularly in the event of rain. 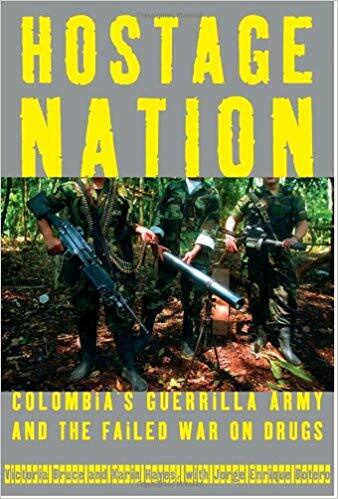 The captain offered to take the three people to a cheap hotel called 'Las Villas de Santa Rosa', which has a reputation - principally because it has played host to the commanders of the local paramilitary death squads and as a permanent base for many of the paramilitaries themselves. Gearoid O Loingsigh and his colleagues refused the offer and told the captain they would instead be staying at the Hotel Continental : "That evening the death squads came looking for us and the first place they went to was the Hotel Continental looking 'for the foreigner' - the captain being the only person who thought we would be there", said O Loingsigh. "However, we had actually managed to hire a private truck for $100 to take us into the mountains. When I rang Sembrar, they told me to pay whatever was the asking price but not to stay in the town under any circumstances. That's how I came to be on the run." He stresses that the arrest of the 'Colombia Three' presented the military, and the paramilitaries who have the tacit complicity of the security forces, with an excuse rather than a legitimate reason to make life more difficult for Irish people in that country. "Obviously, the fact of their detention doesn't help as a guilt by association can be inferred by some people. However, it is more as an excuse than anything else. ..we should be just about finished our multitasking job - this Sunday coming (the 14th October) will find myself and the raffle team in our usual monthly venue on the Dublin/Kildare border, running a 650-ticket raffle for the Cabhair organisation : the work for this event began yesterday, Tuesday 9th October, when the five of us started to track down the ticket sellers and arrange for the delivery/collection of their ticket stubs, cash and unsold tickets (yeah, right!) and, even though the raffle itself is, as stated, to be held on Sunday 14th October, the 'job' is not complete until the following night, when the usual 'raffle autopsy' is held. The time constraints imposed by same will mean that our normal Wednesday post will more than likely not be collated in time for next Wednesday (17th) and it's looking like it will be between that date and the Wednesday following same before we get the time to put a post together unless, that is, ye lot need to be reminded - again - to vote NOTA in the Free State presidential election which will be held here on Friday 26th October next. But, one way or the other, no doubt, between now and the 26th, we'll be suggesting that you cast your ballot properly...! 'GUILTY' OF HIGH TREASON BUT PARDONED AND TRANSPORTED : William Smith O'Brien, (pictured) : died at 61 years of age in Wales, having been exiled from Ireland by the British. On the 17th October 1803, 'Sir' Edward O'Brien (the '4th Baronet' of Dromoland Castle, County Clare) and his wife, Charlotte (nee Smith) - well established political conservatives and supporters of the Orange order - celebrated the birth of their second son, whom they named William (in later years, after inheriting land from his mother, William added the surname 'Smith' to his name). He was educated at Harrow, in London, and Trinity College in Cambridge, and was later to describe his education thus : "I learnt…much that was evil and little that was good..." At 25 years of age (in 1828) he was elected to Westminster for the Conservative Party, for the Ennis constituency, a position he held for four years and, at 29 years young, he married Lucy Caroline Gabbett, and they had seven children together. At 32 years of age he won a seat to represent Limerick. He was a strong supporter of Catholic emancipation and, at 40 years of age, he joined Daniel O'Connell's anti-union 'Loyal National Repeal Association', which he left three years later. Within a few years, he had joined the 'Young Irelanders' organisation and helped to establish within it a group called 'The Irish Confederation' which organised as best it could for an armed uprising in Ireland against British rule , but the timing was wrong: Ireland was suffering through a London-encouraged 'Gorta Mór', and its remaining people were too exhausted for anything other than trying to stay alive. 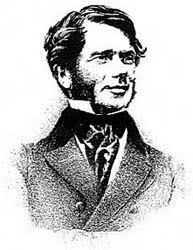 One of the leaders of 'The Young Irelanders' , John Mitchel, was 'arrested' for writing "wild and menacing words" then, in April 1848, the 'Treason Felony Act' was introduced, followed by the suspension of 'Habeas Corpus' on July 25th, 1848 ; William Smith O'Brien recognised that the British were 'battening down the hatches' and, with John Mitchel in a British prison, he was in command. He called for an immediate Rising against the British and an attempt at a rebellion did take place on the 29th July 1848 in Tipperary but it failed, leading to the arrest of the leaders of the 'Confereration', Thomas Francis Meagher, Terence McManus, Patrick O'Donohoe and William Smith O'Brien (who was arrested on the 6th August 1848 and tried at a special sitting of the district court at Clonmel, Co. Tipperary : he was sentenced to death on 10th October 1848), all of whom were deemed by the British to be guilty of High Treason and were sentenced to be hung, drawn and quartered. Following the court case, meetings were held in Ireland and England with the aim of raising a petition against the severity of the sentences and to highlight the fact that the jury involved had recommended clemency but were ignored by the judge ; over 80,000 people willingly listed their names, addresses, occupations etc (in what is considered to be the first mass political petition movement) resulting in the sentences being commuted to transportation for life. The four 'dissidents' left Ireland on the 29th July 1849 for exile in Van Diemen's Land. On the 26th February 1854, O'Brien won a conditional pardon which banned him from entering Ireland and he and his family moved to Brussels where, amongst other duties, he wrote a political book : he won his final pardon two years later, in May 1856, and returned to Ireland to a hero's welcome. Asked how he now felt about his actions, he replied - "I had firmly resolved not to say or write or do anything which could be interpreted as a confession on my part that I consider myself a 'criminal' in regard to the transactions of 1848..". His wife, Lucy Caroline, died in Ireland on the 13th June 1861, and he himself passed away three years later, in his 61st year, in Bangor, Wales, and is buried in Rathronan Churchyard in Limerick. The inscription on the family headstone reads - 'Here lies Edward William, eldest son of William Smith O'Brien, a just man, a lover of his people. Born 24 January 1837 Died 21 January 1909. William Smith O'Brien, Born 17 October 1803 Died June 1864. Lucy Caroline O'Brien, Born 23 September 1811 Died 13 June 1861'. Like his son, Edward, William Smith O'Brien was 'a just man, a lover of his people..' and, least we forget, a 'dissident' of his day.